A recent study in the United Kingdom found that a greater percentage of wild gray squirrels solved more difficult food-finding tests than red squirrels. The tests involved a process of pushing and pulling levers to get to hazelnuts. The better problem-solving skills of invasive gray squirrels may explain why they have displaced red squirrels, and are now by far the most common squirrels there. The gray squirrel in the United Kingdom is the same as our Eastern gray squirrel, which the British imported in the 1870’s, when it was considered fashionable to have them on estates. Since then this squirrel has spread and displaced their native red squirrel (which is a different species of red squirrel than our American red squirrel). Squirrels are generally considered beneficial in forests, because they bury tree seeds to eat later, and then forget where they buried some of them. These seeds sprout and grow into trees. 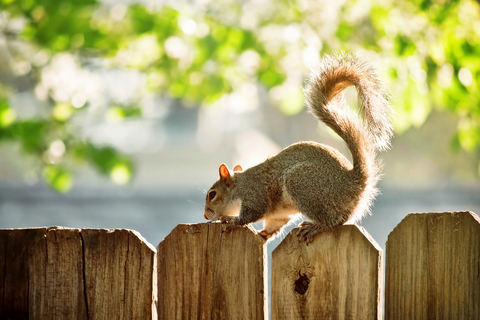 However, gray squirrels are considered pests there because they have taken over much of the territory of their native red squirrels, plus they harm some of the native trees. This study still doesn’t fully explain why gray squirrels are spreading in the United Kingdom. In the tests, some red squirrels solved the task more quickly than gray squirrels, and the successful red squirrels were quicker to change tactics after trying a method that didn’t work.